LabEquipmentsManufacturersIndia is a leading chemical reaction engineering lab equipments manufacturers, suppliers and exporters company in India. We are specialized in supplying chemical reaction engineering laboratory instruments to government organizations, educational institutions, research centers etc at the most competitive prices. 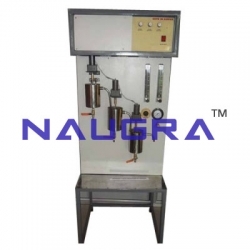 All of our chemical reaction engineering lab instruments are designed by industry experts and these products are appreciated for their excellent quality and high performance. Some of our widely used chemical reaction engineering laboratory instruments are glass autoclaves, heating and cooling baths, cstr & fixed bed reactors, magnetic drive coupling, pressure leaf filters, rocker shaker autoclaves, interchangeable glass instrument etc.